KALETRA is a prescription medicine that is used with other antiviral medicines to treat human immunodeficiency virus-1 (HIV-1) infection in adults and children 14 days of age and older. HIV is the virus that causes AIDS (acquired immune deficiency syndrome). It is not known if KALETRA is safe and effective in children under 14 days old. KALETRA is not a cure for HIV-1 infection. People taking KALETRA may continue to experience illnesses associated with HIV-1 infection, including opportunistic infections. † Eligibility: Available to patients with commercial prescription insurance coverage for KALETRA who meet eligibility criteria. Copay assistance program is not available to patients receiving prescription reimbursement under any federal, state, or government-funded insurance programs (for example, Medicare [including Part D], Medicare Advantage, Medigap, Medicaid, TRICARE, Department of Defense, or Veterans Affairs programs) or where prohibited by law or by the patient's health insurance provider. 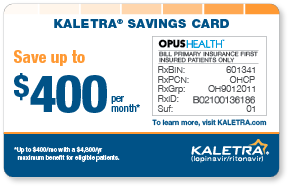 If at any time a patient begins receiving prescription drug coverage under any such federal, state, or government-funded healthcare program, patient will no longer be able to use the KALETRA Savings Card and patient must call OPUS Health at 800.364.4767 to stop participation. Patients residing in or receiving treatment in certain states may not be eligible. Patients may not seek reimbursement for value received from the KALETRA Savings Program from any third-party payers. Offer subject to change or discontinuance without notice. Restrictions, including monthly maximums, may apply. This is not health insurance. Please see full Terms and Conditions. No KALETRA Savings Card? No problem! Patients who have not received a card through the KALETRA Savings Program, or for whom the card isn't working, may still be eligible for savings using the KALETRA rebate form. Eligible patients can use this form to submit a reimbursement claim for KALETRA prescriptions. Submit the copay card authorized for all commercially insured patients by the patient's primary insurance as a secondary transaction to OPUS Health. This offer may be changed or discontinued without notice. What is KALETRA® (lopinavir/ritonavir) tablets and oral solution? KALETRA is a prescription medicine that is used with other antiretroviral medicines to treat human immunodeficiency virus-1 (HIV-1) infection in adults and children 14 days of age and older. HIV is the virus that causes AIDS (acquired immune deficiency syndrome). It is not known if KALETRA is safe and effective in children under 14 days old. Inflammation of your pancreas (pancreatitis). KALETRA can cause pancreatitis, which may be serious and may lead to death. People who have high levels of a certain fat (triglycerides) have a risk for developing pancreatitis. If you have advanced HIV-1 disease, you may have an increased risk of high triglyceride levels in your blood and pancreatitis. If you have a history of pancreatitis, you may have an increased risk of it recurring during treatment with KALETRA. Tell your healthcare provider if you have any signs or symptoms of pancreatitis including nausea, vomiting, and/or stomach area (abdominal) pain. Liver problems. Liver problems, including death, can happen in people who take KALETRA. Your healthcare provider should do blood tests before and during your treatment with KALETRA to check your liver function. If you have hepatitis B, hepatitis C, or other liver problems, you may have an increased risk for developing new or worsening liver problems during treatment with KALETRA. Tell your healthcare provider right away if you have any signs or symptoms of liver problems including loss of appetite, yellowing of skin or eyes (jaundice), dark-colored urine, pale-colored stools, itchy skin, and/or stomach area (abdominal) pain. Changes in your heart rhythm and the electrical activity of your heart can occur when taking KALETRA. These changes can lead to serious heart problems. Your risk for these problems may be higher if you already have a history of abnormal heart rhythm or other types of heart problems, or if you take other medicines that can affect your heart rhythm while you take KALETRA. Tell your healthcare provider right away if you experience dizziness, lightheadedness, fainting, and/or a sensation of abnormal heartbeats. Do not take KALETRA if you are allergic to lopinavir, ritonavir or any ingredients in KALETRA. Do not take KALETRA if you take any of the following medicines: alfuzosin; ranolazine; dronedarone; colchicine, if you have kidney or liver problems; rifampin; lurasidone; pimozide; ergot-containing medicines, including dihydroergotamine mesylate, ergotamine tartrate, methylergonovine; cisapride; elbasvir/grazoprevir; lovastatin; simvastatin; sildenafil (REVATIO®), when used for the treatment of pulmonary arterial hypertension; triazolam; midazolam, when taken by mouth; St. John’s Wort (Hypericum perforatum). What should I tell my healthcare professional before taking KALETRA? Tell your healthcare professional about all of your medical conditions, including if you have ever had a serious skin rash or an allergic reaction to medicines that contain lopinavir or ritonavir; have or had pancreas problems or liver problems, including hepatitis B or hepatitis C; have any heart problems, including if you have a condition called congenital long QT syndrome; have low potassium in your blood, diabetes, high cholesterol in your blood or hemophilia (KALETRA may cause increased bleeding); or are pregnant or plan to become pregnant, or are breastfeeding or plan to breastfeed. If you take KALETRA during pregnancy, you should talk with your healthcare provider about how you can take part in an Antiretroviral Pregnancy Registry. Do not breastfeed if you take KALETRA. You should not breastfeed if you have HIV-1 because of the risk of passing HIV-1 to your baby. Tell your healthcare provider about all of the medicines you take, including prescription and over-the-counter medicines, vitamins, and herbal supplements. Many medicines interact with KALETRA. Keep a list of your medicines to show your healthcare provider and pharmacist. Do not start taking a new medicine without telling your healthcare provider. Your healthcare provider may need to change the dose of other medicines while you take KALETRA. Diabetes and high blood sugar (hyperglycemia). You may develop new or worsening diabetes or high blood sugar during treatment with KALETRA. Tell your healthcare provider if you get any of the following signs or symptoms: urinate more often than usual, increased hunger or thirst, unusual weight loss, increase in your blood sugar levels. Your healthcare provider may need to start you on medicine to treat high blood sugar, or change your diabetes medicines. Large increases in certain fat (triglycerides and cholesterol) levels in the blood have occurred in some people receiving KALETRA. Your healthcare provider should do blood tests to check your cholesterol and triglyceride levels before you start taking KALETRA and during your treatment. Changes in body fat can happen in some people who take anti-HIV-1 therapy. The cause and long-term health effects of these conditions are not known at this time. Increased bleeding has occurred in some people with hemophilia who have taken KALETRA or similar medicines. Skin rash, which can be severe, can happen in people who take KALETRA. Tell your healthcare provider if you have a history of skin rash with other medicines used to treat your HIV-1 infection or if you get any skin rash during treatment with KALETRA. Common side effects of KALETRA include diarrhea, nausea, vomiting, and increased fats in blood (triglycerides or cholesterol). These are not all of the possible side effects of KALETRA. Please see the Full Prescribing Information, including the Medication Guide, for KALETRA. You may also call 1-866-KALETRA for more information, or AbbVie Customer Service at 1-800-255-5162. 1. KALETRA [package insert]. North Chicago, IL: AbbVie Inc. If you have any questions about AbbVie's Kaletra.com website that have not been answered click here. This website and the information contained herein is intended for use by US residents only, is provided for informational purposes only and is not intended to replace a discussion with a healthcare provider. All decisions regarding patient care must be made with a healthcare provider and consider the unique characteristics of each patient. Please expand for Detailed Important Risk Information. Interactions with other medicines. It is important to know the medicines that should not be taken with KALETRA. For more information, see "Who should not take KALETRA?" By selecting "Continue" below, you certify that you are a Healthcare Professional and that you wish to proceed to the Healthcare Professionals Only section on the AbbVie Medical Information site. Products or treatments described on this site are available in the U.S., but may not be available in all other countries. Based on your answer to the question, you are not eligible to receive the KALETRA Savings Card. The KALETRA Savings Card is not available to individuals who are paying cash for their prescription or who are receiving prescription reimbursement under a state or federally funded insurance program. Based on your answer to the question, you are not eligible to submit a rebate form for your KALETRA prescription.